I’m sure I won’t fall into the same trap as last time. And when the El Salvadorean officials check my passport I hope they don’t recall what happened in May 2006! Due to a damaged bridge on the border (over the dirty River Paz) only light traffic are crossing these days (and months!). So all passengers on our flash double deck bed-bus are merrily walking from this side (Valle Nuevo, Guatemala) to the other (Las Chinamas). It’s several hundred metres across a makeshift pedestrian extension hung out on one side of the bridge under repairs. Luckily they’re taking our checked on bags across in a ute for us. Dodging the crazy money changers offering exchange of Quetzales to US Dollars (the Salvadorean currency for more than a decade now) I watch the ute (pick-up) with all the luggage go by in a swirl of dust; riding happily are three armed guards sitting variously on the luggage piled high. I spy my backpack poking out and smile. Blessed are the money changers for they shall inherit the faulty calculators! They tried to rip me off and I came back to haunt them and claimed my dues. Now I’m on the other side and in the other bus in the same top deck panorama seat and the Salvador immigration official is coming through the bus. He flicks through my passport and I’m wondering if he has access to my immigration fine from eight years before! I maintain my gaze straight ahead. He hands the passport back. No stamp!? He insists that no stamp is needed and he moves on from seat to seat registering each passengers passport details. Once bitten, twice shy! I insist on the stamp. With a weary sigh he repeats a third time for my benefit – and the bus’s – that an entry stamp is not necessary. With a little twinge of doubt I sit back and watch the dry hot world of El Salvador flash past before me. 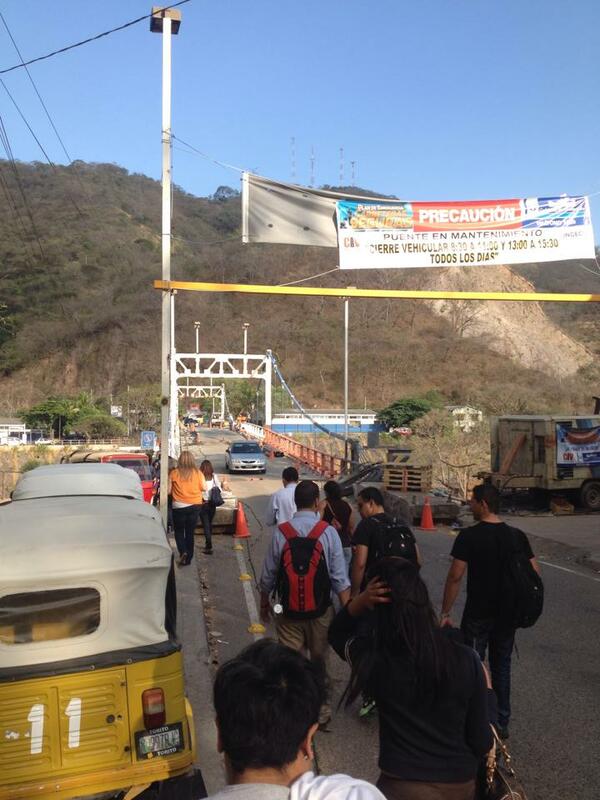 Bridge over Rio Paz (border) damaged and open to only light traffic.